An “evil attack” is how Attorney General Jeff Sessions described the attack that led to the death of counter-protester Heather Heyer and the injury of multiple others this weekend in Charlottesville, Virginia. Heyer was killed after James Alex Fields, Jr. plowed his car into a group that gathered to protest white nationalists. The attack, which was captured on video and photographed, showed Fields driving his car into protesters on a Charlottesville street, hitting numerous people before colliding with other cars. (Fields has been denied bail and is still in jail. He will return to court on August 25.) A photograph captured by Ryan M. Kelly shows the grim moment of Fields’s action: his gray car plows into a group carrying signs of solidarity and support for the Black Lives Matter movement, as bodies fly into the air and shoes scatter across the street. The photograph is a testament to the callousness of the crime Fields’s has been accused of—a persistent reminder that, as white nationalists continue to falsely claim the neutrality of history in public spaces, that those very public spaces have never been neither safe nor neutral for a vast majority of citizens. Sessions’s language was stronger than Donald Trump’s. On Saturday, the president condemned the “egregious display of hatred, bigotry, and violence on many sides...on many sides.” He refused to name white nationalists specifically or to denounce the ideology, speaking only in generalities about “violence” and expressed only with the glibness of platitudes. It was a revealing—if deeply unsurprising—moment. It was yet another reminder that the Trump White House sees “evil losers” and “beautiful people” only when it furthers its nativist agenda. Otherwise, there are only false equivalencies and tacit sympathies. Though Sessions’s approach was a departure from Trump’s, the Attorney General willingly offered up a defense of the president’s statements. “[Trump] explicitly condemned the kind of ideology behind these kinds of movements of Nazism, of white supremacy, of the KKK, that is his unequivocal position. He totally opposes those kinds of values,” Sessions said. 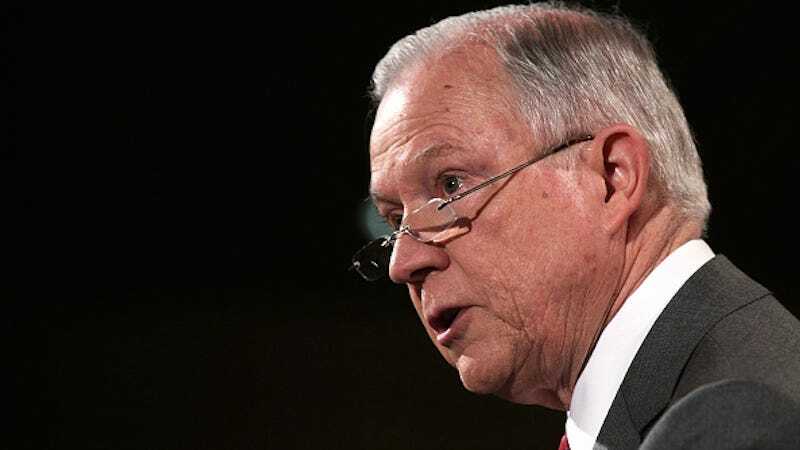 Perhaps Sessions heard a different Trump and has been hearing a different man than the one who is in possession of every dog whistle, who has called immigrants “animals,” and who regularly warns of the threats that any person of color presents to national identity and safety. It’s an unconvincing response and, as Politico notes, Republicans are still supportive of the president’s agenda even as they seek to distance themselves from his language. The presumption in these responses that it’s simply Trump’s expression of his ideologies that are the problem, not the ideologies and subsequent policies themselves, is depressingly empty. As Sessions’s GMA interview showed, he and his colleagues are willing to carry the administration’s water, no matter the costs. It’s perhaps a depressing irony that even as Republicans struggle to appropriately name racially motivated violence, they are unwilling to confront its very genesis.